With the holidays upon us, you may have butter and gravy on the table. Why not add a bottle of traditional balsamic vinegar? A few drops of balsamic adds a burst of flavor to any dish, and I love it drizzled on vegetables, especially roasted Brussels sprouts, and a drop on pumpkin pie would be fantastic. 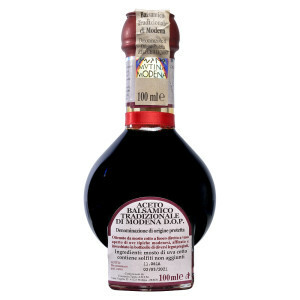 Balsamic vinegar also makes a great gift for the foodie on your list. When you go to buy that vinegar, how do you know what to buy? Facing supermarket shelves of balsamic vinegar is overwhelming. I mean, where do you start? On a recent visit to Acetaia Leonardi, an authentic, traditional balsamic vinegar producer in Italy, I learned what it takes to make this handcrafted, artisan product. If you want to get a true traditional balsamic vinegar, an Aceto Balsamico Tradizionale di Modena D.O.P., handcrafted by a producer such as Leonardi, there are a few tips to guide you to make sure you’re buying the real thing. Shop at a specialty grocer or online. You’re not going to find a traditional balsamic vinegar at the supermarket. They are too expensive. Most grocery store balsamic vinegars are less than $10 per bottle while traditional balsamic vinegar starts at about $80 per bottle and can go up to $150 or more. Most of the supermarket brands are mass produced with caramel, sugar and other flavorings and preservatives. 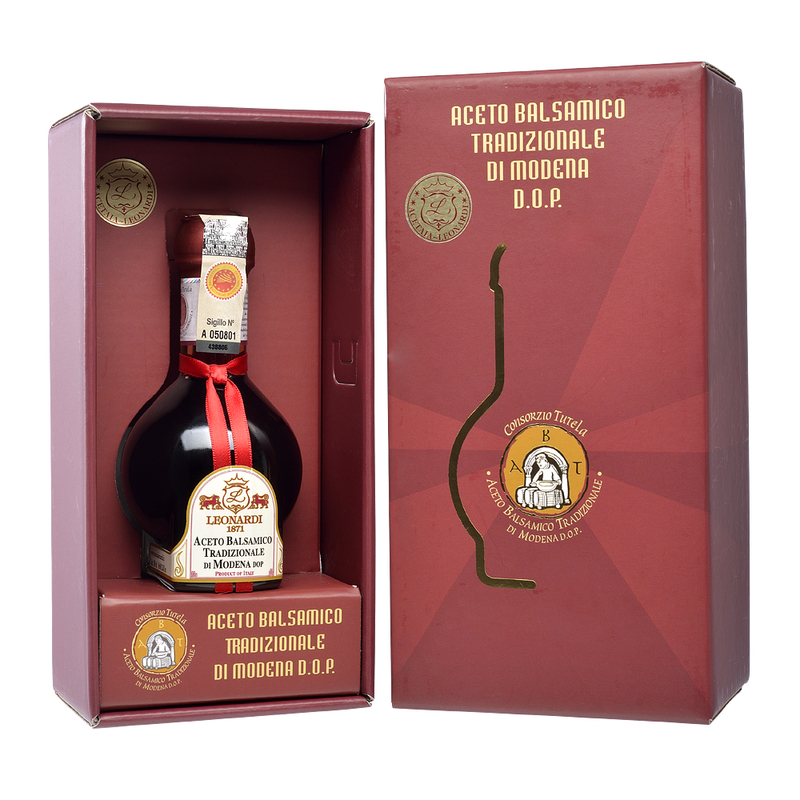 True traditional balsamic vinegar has only one ingredient: cooked grape must, or mosto d’uva cotto. 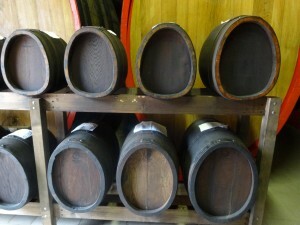 True traditional balsamic vinegar must be aged a minimum of 12 years in a variety of wood casks. • On the front label, look for this phrase: Aceto Balsamico Tradizionale di Modena D.O.P. The Initials D.O.P. are very important. 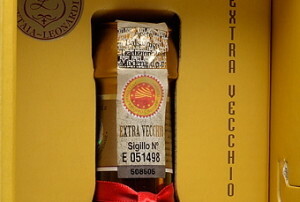 It means the balsamic vinegar has been certified as a true traditional balsamic vinegar. D.O.P. stands for a protected area of origin. All D.O.P vinegars must be certified by the Consorzio Produttori Aceto Balsamic Tradizionale di Modena. •On the back label look at the ingredients. The only ingredient should be cooked grape must, or mosto d’uva cotto. •On the back label it should also say produced and bottled by, as in the case of Leonardi. This means the producer actually grew the grapes used in the vinegar and produced the vinegar too. It’s an indication of higher quality. •There will be a seal on top of the bottle. This seal bears a number and a hologram, a sign of certification from the Consorzio. •You may see the terms extra vecchio and affinato. Extra vecchio means the vinegar has been aged at least 25 years. Affinato means the vinegar has been aged at least 12 years. 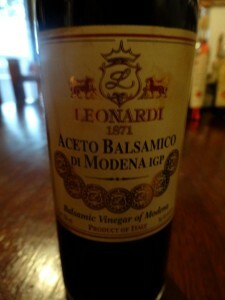 What is Aceto Balsamico di Modena I.G.P.? The initials I.G.P. stand for protected geographical indication. I.G.P. balsamic vinegar can be high quality when made the same way as traditional balsamic vinegar. 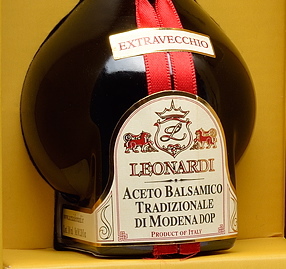 It is aged for less time, a minimum of six years, vs. a minimum of 12 years for traditional balsamic. Leonardi makes several I.G.P. balsamic vinegars (of varying ages) Here you want to see only two ingredients on the label: cooked grape must (mosto d’uva cotto) and wine vinegar. If you see caramel, that means it has been added for color and is of a lesser quality. I.G.P. balsamic vinegars are less expensive since they aren’t aged as long. Expect to pay in the $25-$50 range for a good bottle. What is a balsamic vinegar condimento? 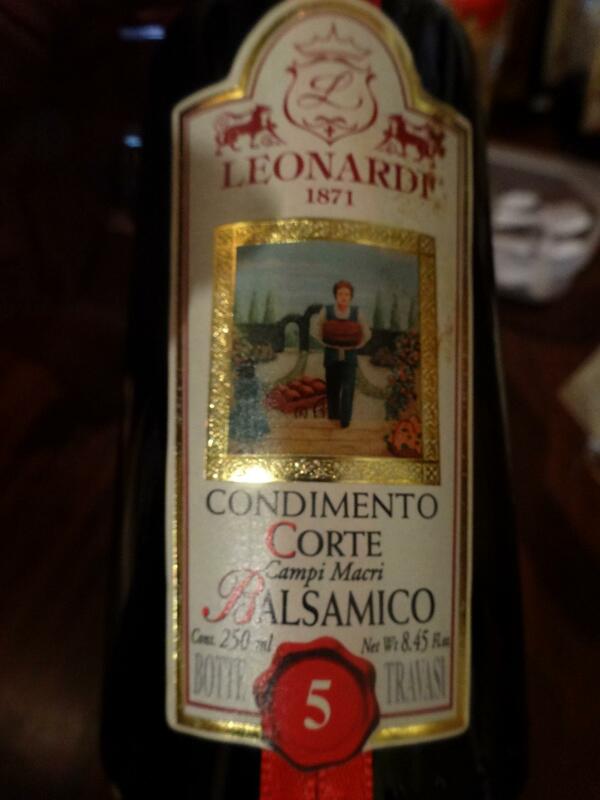 You will also see balsamic vinegar “condiment”. Depending on the producer, this can also be a high quality product and a good alternative to traditional balsamic vinegar for every day use. 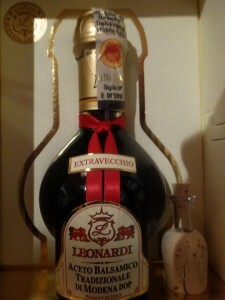 Leonardi makes a condimento that is aged 30 years and is thick and sour and sweet. While a good one is made the same way as a traditional balsamic vinegar, condimentos do not need to be certified, and they can be made outside the Modena region. Condimentos can be younger too, even three to five years old. Condimentos make great salad dressings. They are much less expensive too, although a good one can cost more than $30. The only ingredient in a condimento should be only acetified cooked grape must Caramel and other ingredients are signs of a lower quality product. Everything else. You’ll see lots of bottles of “balsamic vinegar of Modena”, but Federica Gibellini of Acetaia Leonardi says, “the vinegar in the supermarket is obtained by cooking the grapes for five hours because they cannot waste time in cooking and aging in order to obtain the thickness. They add sugar, caramels other preservatives for coloring, thickness and flavoring.” There’s also no guarantee that the vinegar was even made in the Modena region. Big difference in quality and taste (and price). If you see caramel, sugar or any other ingredient, this is most likely a mass-produced vinegar and won’t have the same flavor intensity of sweet and sour that an artisan balsamic vinegar should. It will be thinner in consistency and perhaps even bitter. These vinegars are good to use for cooking in recipes that call for that balsamic vinegar where you are actually cooking the vinegar down. For example I have a lamb chop recipe with a sauce made with 1 cup of vinegar that you reduce with rosemary. I’m not using the good stuff here (but I’ll finish the dish with a drizzle of it). Yes there is a big price difference, but when you understand the long, hand crafted process behind a vinegar like the ones made by Leonardi, you can understand why it’s more expensive. Keep in mind that you don’t need to use as much of a traditional balsamic vinegar. 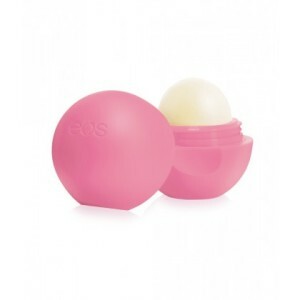 Because it is thicker and more intense, a little goes a long way, and the bottle will last you longer. Once balsamic vinegar is bottled, it does not continue to age or improve, so it’s best to use right away. Good balsamic vinegars can keep up to 10 years if you store them away from light and heat. Above all else, do not refrigerate your vinegar. You can find Leonardi vinegar at The Pasta Shop in Berkeley and Oakland and on their website Market Hall Foods.